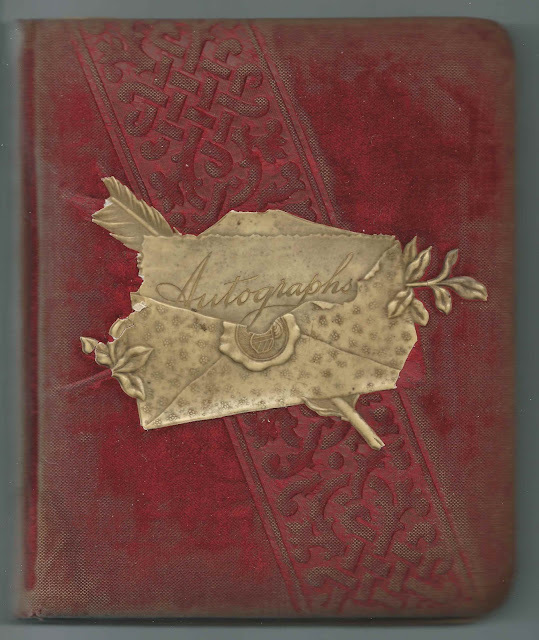 Autograph album kept from April 4, 1890 by Cynthia May Chase, "Tinnie", of Buckfield, Maine. 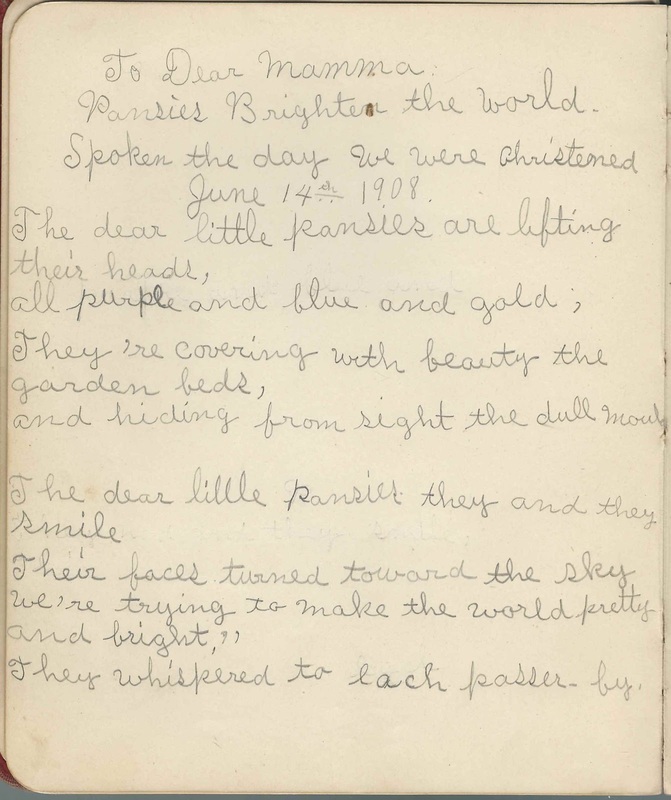 The album apparently later came to light during the youth of Tinnie's daughters, who inscribed pages in 1908. A number of inscribers gave Brookville, a village in the town of Holbrook, Massachusetts, as their residence, and some appear to have been related to Tinnie. 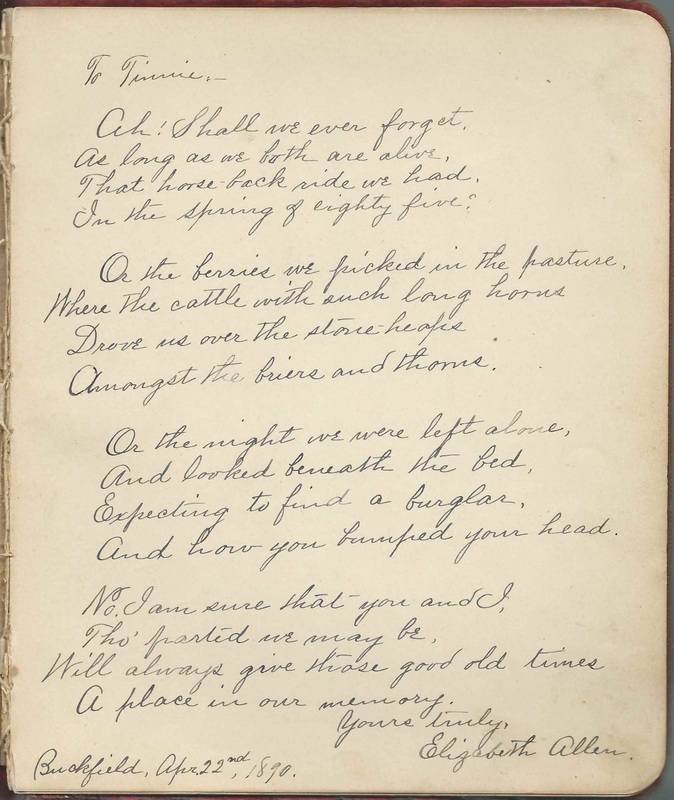 Tinnie inscribed the first two handwritten pages in the album. 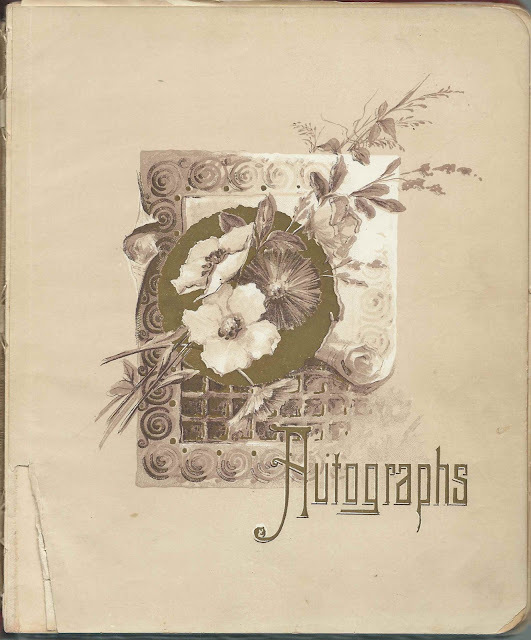 The album measures approximately 8-1/4" x 7" and contains the sentiments of 40 of Tinnie's relatives, friends and schoolmates. An alphabetical list of the inscribers, together with any personal information they offered, appears at the end of this post. Cynthia May Chase was born April 4, 1875 at Buckfield, Maine, the daughter of Lewis M. Chase and Eva Luella (Bisbee) Chase. Somewhere along the line, Cynthia acquired the nickname "Tinnie", presumably because of the pronunciation of her name by herself or a sibling. On September 15, 1897 at Buckfield, Maine, Tinnie married Perley Everett Wills, son of Ruel Wills and Esther (Corliss) Wills. Tinnie and Perley had at least three children and lived at 225 Knox Street, Rumford Falls, Maine, before moving to the Midwest, where Perley worked for the railroad. Tinnie's daughter Evelyn Esther Wills of 224 Knox Street, Rumford Falls, Maine, inscribed a page on June 14, 1908, the "day we were christened". Tinnie died of bronchial pneumonia at Brazil, Indiana, on April 14, 1937. Tinnie and Perley, who died in 1955, are buried in the Maple Grove Cemetery at Mechanic Falls, Maine. Inscribers who mentioned a kinship with Tinnie or where a kinship might be possible: and there are likely several more - refer to the list of inscribers at the end of this post. Aunt Abbie; inscribed at Brookville, Holbrook, Massachusetts, on August 5, 1890. There was an Abigail (McCorrison) Hodge who was living in the household of Hartley Laurington White (who inscribed the left facing page) and his parents Cornelius Laurington White and Elizabeth (Dodge) White at the time of the 1870 Census of Holbrook, Massachusetts, but she, born in 1792, had died in 1881. I'm guessing that inscriber Abbie was related to the White or Dodge families by blood or marriage. See the list of inscribers for more people who lived at Brookville, Massachusetts. I. W. Shaw of Buckfield, Maine; inscribed on November 16, 1890. Tinnie's cousin. 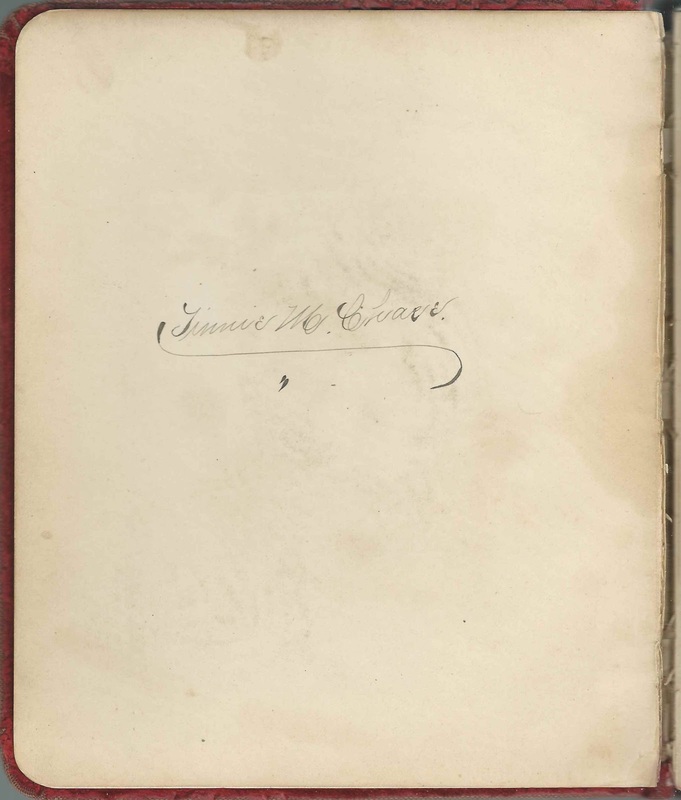 Presumably Isaac Whiting Shaw, whose sister Ellen F. Shaw inscribed the right facing page. They were the children of Jotham William Shaw and Rosanna B. (Irish) Shaw. Ernest Raymond Wills of Skillings, Maine; inscribed on August 13, 1899. Ernest was a brother to Tinnie's husband Perley Everett Wills. Skillings is a village in Turner, Maine. A page that deserves to be shared, that of H. A. 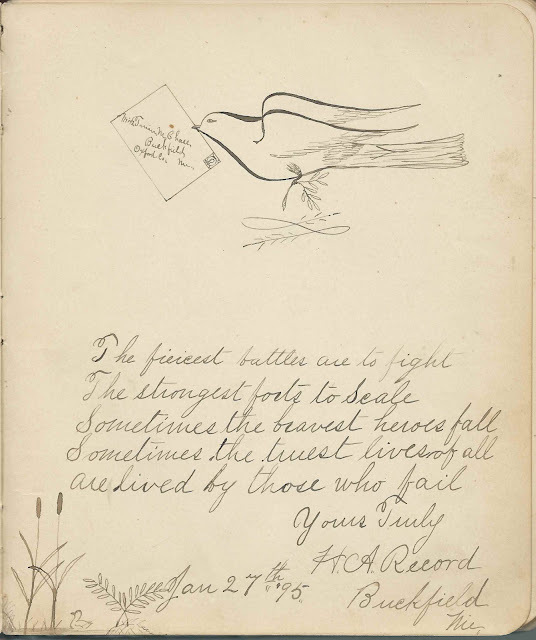 Record, who inscribed his page at Buckfield, Maine, on January 27, 1895 and included a wonderful sketch of birds and cat-o-nine-tails. And another, the page of Elizabeth Allen, inscribed at Buckfield, Maine, on April 22, 1890, that includes a list of the adventures she and Tinnie had shared. Aunt Abbie; inscribed at Brookville, Holbrook, Massachusetts, on August 5, 1890. There was an Abigail (McCorrison) Hodge who was living in the household of Hartley Laurington White (who inscribed the left facing page) and his parents Cornelius Laurington White and Elizabeth (Dodge) White at the time of the 1870 Census of Holbrook, Massachusetts, but she, born in 1792, had died in 1881. I'm guessing that inscriber Abbie was related to the White or Dodge families by blood or marriage. Amanda M. Bisbee; inscribed at Brookville, Holbrook, Massachusetts, on September 1, 1890. Presumably Amanda Marie (Thayer) Bisbee, wife of Winslow Taylor Bisbee. Abbie C. Briggs; inscribed at Buckfield, Maine, on July 17, 1890. "Remember your friends at the 'Thompson Farm'"
Meda A. Gilbert; inscribed on August 23, 1892. Could she be the Mary Almeida Gilbert who married inscriber Percy Howard Kilbreth? Ethel Hodge; inscribed at Brookville, Massachusetts, on August 1, 1890. Brookville is in Holbrook, Massachusetts. H. A. 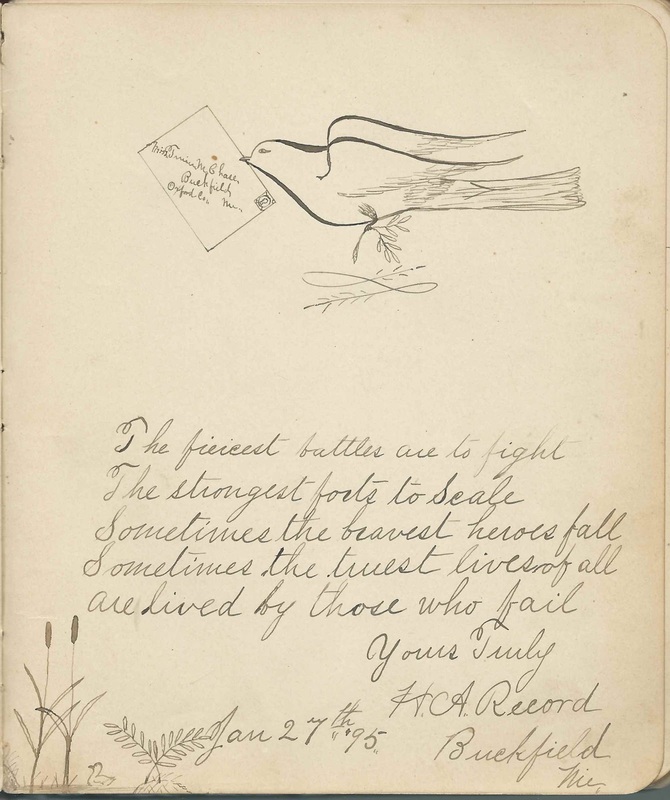 Record of Buckfield, Maine; inscribed on January 27, 1895. Sketched a bird with an envelope addressed to Tinnie, with cat-o-nine-tails and ferns in the lower left corner. 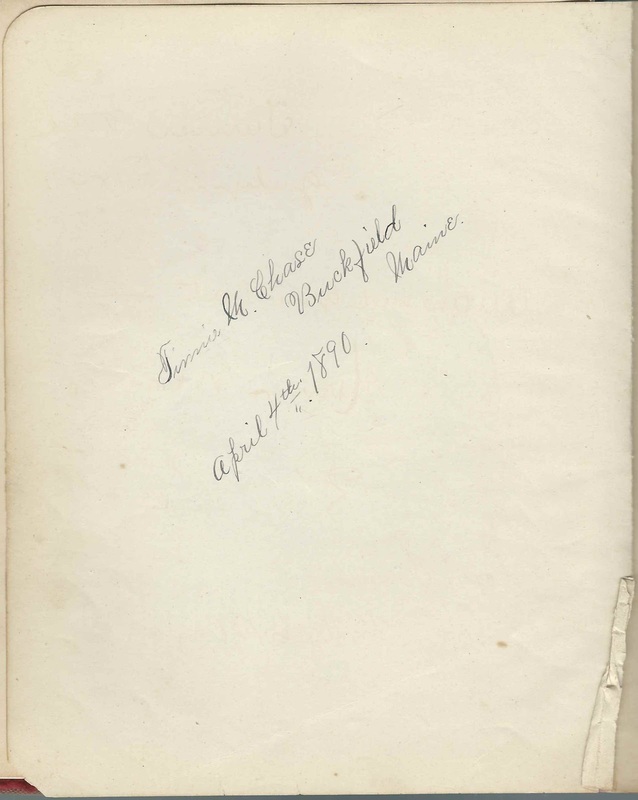 C. O. Russell of Chase's Mills, Maine; inscribed on May 24, 1893. Judging from the context of the autograph album, this is the Chase's Mills in Turner, Maine; not in East Machias, Maine. Hartley L. White of Brookville, Massachusetts; inscribed on August 16, 1890. Hartley Laurington White. Brookville is a village in Holbrook, Massachusetts. Mrs. Martha Whitman of Buckfield, Maine; inscribed on December 15, 1894. Martha (Dunn) Whitman, wife of Henry W. Whitman, who inscribed the right facing page. 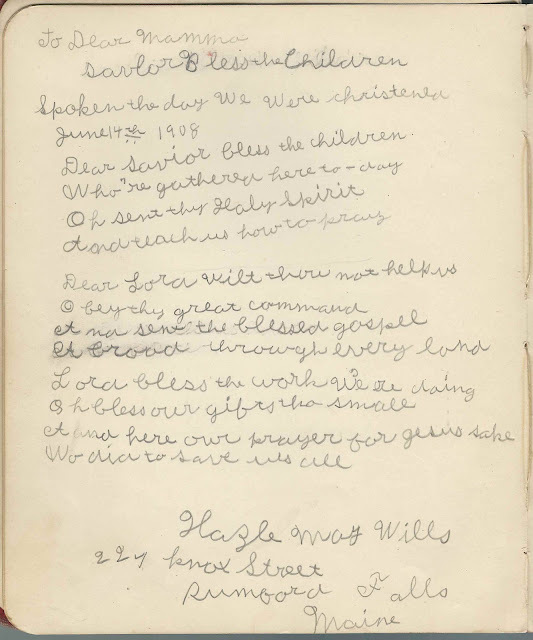 Henry W. Whitman of Buckfield, Maine; inscribed on December 15, 1894. Henry's wife Martha (Dunn) Whitman inscribed the left facing page. Mrs. Leon E. Whitman of Hebron, Maine; inscribed on October 18, 1893. She was Fannie T. (Cushman) Whitman. Hazle May Wills of 224 Knox Street, Rumford Falls, Maine; inscribed on June 14, 1908. Tinnie's daughter Hazel May Wills with husband Perley E. Wills. 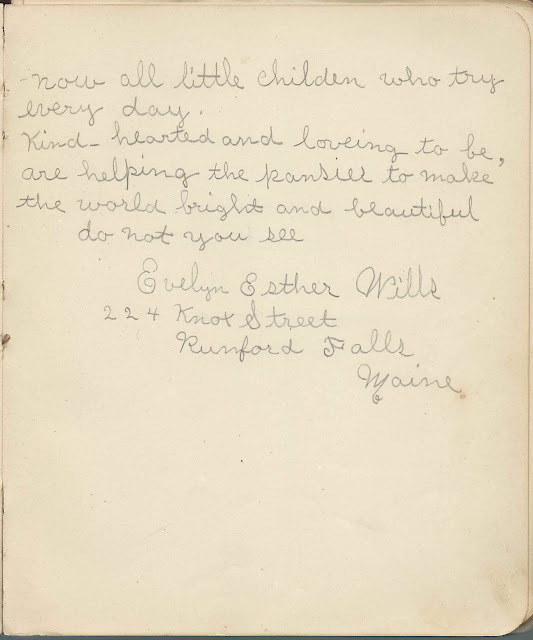 2 page sentiment by Evelyn Esther Wills of 224 Knox Street, Rumford Falls, Maine; inscribed a two-page sentiment, on June 14, 1908. Evelyn was Tinnie's daughter with husband Perley E. Wills.